The world that we live in has turned into a global marketplace. If businesses do not modify their operations to match the increasing level of globalization and interconnectedness, they may lose out on their competitive advantage. In fact, in one way or the other, many types of organizations, such as multinational corporations (MNCs), consulting firms, and financial institution, have a global presence. They’ve broadened their customer base to include international clients also. What will an International Business Degree teach you? Formal education, such as Online Degrees in International Business is an important prerequisite for various positions in this sector. Apply fundamental business practices to dealing with international business problems. Besides technical and specialized knowledge in business principles, you’ll also become familiar with economic, social, political, and legal practices of various countries, and how they impact international business and trade. Analyze new and emerging challenges as well as opportunities that businesses in international markets are faced with. International business comprise the totality of business transactions and practices all over the world. What levels of International Business program and degree are offered? You can find these programs being offered at various levels including associate, bachelors, and masters. Some institutes also offer diploma and certificate programs in international business. These are suitable for professionals who’re already working in globalized businesses but wish to enhance their knowledge, keep up with the developments in the field or seek new career opportunities. How long will it take to complete degree in international business? While an associate or a master’s degree may last for 1 to 2 years, a bachelor’s degree make take up to 3-4 years to complete. The duration of the program will also be determined by the route that you take. You may be able to complete the degree in a shorter period of time if you enroll in an accelerated coursework option. Similarly, the program may take longer to complete if you opt for a self-paced degree. In every university, you’ll find a wide range of courses being offered. Although there may be variations, you’ll typically be required to take some core courses along with a few elective modules. You may add a specialization too. In this way you’ll be able to adjust your program according to your academic and professional aspirations. Benefits of an International Business Degree? There are many different jobs in international business, each with a different set of responsibilities and activities. Graduates with a degree in international business may seek positions in international or local firms, both in the private sector as well as the public. Besides these basic functions, some business organizations also conduct research and service activities. They are responsible for investigating and inspecting people as well as goods and merchandise, travelling or transporting across borders respectively. They have to make sure that immigration and customs laws and regulations are properly enforced and followed. They carry out research and identify new business opportunities and related international market factors such as economic, social, and political conditions that may impact business operations. Research analysts usually work in collaboration with senior management and group heads. They are responsible for the development and maintenance of relationships with suppliers, agents, distributors, dealers, partner firms and clients in other countries. Marketing representatives make every effort to expand sales and generate new business for manufacturing and service companies. They are responsible for dealing with cross-border transactions as well as accounting issues associated with international trade. In addition to having sufficient technical knowledge in accounting, international accounting specialists need to be well aware of international trade laws, taxation rules, and formal procedures and practices. How long does it take to get an international business degree? An associate degree in international business can take up to two years to complete, with 60-70 credits. A bachelor’s degree in international business takes four years to complete with around 120-130 credits. A master’s degree in international business would take two years to complete and a doctoral degree in this field would take at least five years. What are the requirements to get an international business degree? To get an international business degree you will need to complete courses such as organizational leadership, strategic planning, accounting and finance, information technology, global business landscape, international marketing, human resource management and so on. Depending on the degree, you might also be required to submit a thesis at the end of the program. How much can I make with an international business degree? An international business degree can lead to a variety of careers – business adviser, business analyst, product manager, purchasing manager, marketing executive, corporate investment banker, human resources officer, management consultant and so on. The amount of money you make with an international business degree would depend on your chosen career path. For instance, Marketing Managers had a mean annual wage of $145,620 as per BLS in 2017. Which universities offer the best International degrees? Which specialization areas are offered with the online International Business Degrees? Which international business degrees online are usually covered and what do they teach? 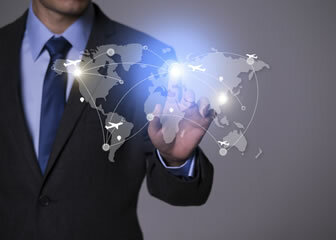 What are the basic benefits I can get by enrolling in an online international business degree? Q:What are the common careers after the International Business degrees completion? Q:Which universities offer the best International degrees? A:International degrees offered at our website are of the best universities of the world. Q:What are the main components of the International Business degree program? A:The International Business curriculum ensures giving the students a global business perspective, making them understand the international market, economy and trade and how business is done across the continents. Courses such as Accounting, Business Strategy, Marketing, Human Resources, Information Management Systems, Economics, Project Management, Performance Appraisal are the core areas of study in any such program. Q:Does any university allow students to take the international business courses online? A:Yes. A number of universities listed on our website allow students to complete the international business courses through online programs. Students interested in pursuing bachelor level courses can get enrolled in the Bachelor of Science in Business Administration - International Business degree offered by Colorado Technical University Online and those who wish to take up master level courses can pursue the Master in International Business degrees offered by Strayer University and American InterContinental University Online. Q:Which specialization areas are offered with the online International Business Degrees? A:The Online International Business Degrees boast a range of courses, which are designed to equip students with global business knowledge. The commonly taught courses in these degrees are: Intercultural communication, Foreign languages, International marketing, Global logistics, and International finance. Q:With an international business degree online, will I be able to get a managerial job overseas? A:A degree in international business is designed to equip students with knowledge about business strategies used globally. Much of the coursework revolves around foreign markets and business environments. You can qualify for managerial jobs in many international organizations. The job position will depend upon the level of degree and specialization area. Q:Which international business degrees online are usually covered and what do they teach? A:Various certificate, associates, bachelors, and masters degrees are offered in international business. These degrees provide a comprehensive knowledge of business worldwide. It enables students to understand business philosophies and practice in international settings. Various business courses taught include marketing, economics, finance, along with courses such as international regulations and cultural roles in international business. Q:What are the basic benefits I can get by enrolling in an online international business degree? Q:What are the entry Requirements of International Business Degree? A:The entry requirements for a degree in international business will vary depending on the university you are apply to and whether you're applying for a bachelors or masters level program. Generally, entry requirements for a Bachelor's degree program are: a high school diploma or GED with a GPA specified by the institution you are applying to, and appropriate SAT OR ACT scores. For Master's degree programs, individuals will have to have a bachelor's degree, letters of recommendation, and some work experience. Do some research into the universities you are interested in to find out more about the admission criteria.